I have a trip planned to Yosemite in July, but having read that early May is the best time to view the waterfalls, I couldn't resist. 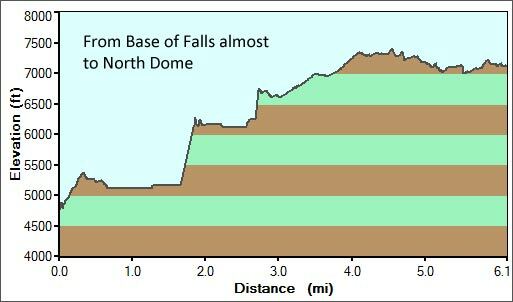 The original plan was to go easy on this trip and do a few day hikes. The problem though was all the campsites were already full. There was another option though... you can get a wilderness permit and then hike in the backpacker's campground. So with that in mind, I invited Mike along, and told him how easy and awesome the trip would be. 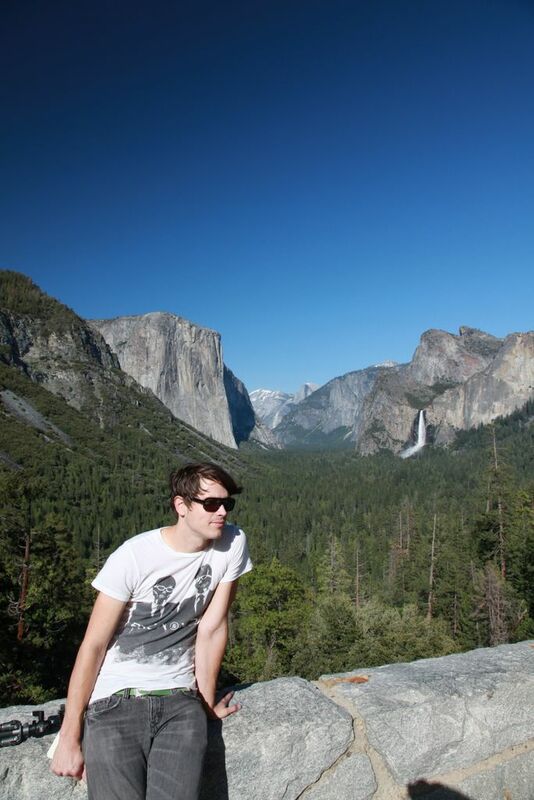 After a five hour drive from LA, we arrived at Yosemite. We first stopped at the Wawona ranger station to pick up the wilderness permit. When I told the ranger of my plans, she stated that we couldn't do that. Instead, she asks "Do you not want to camp in the wilderness?". "Of course I do!" "Then why don't you hike up Yosemite Falls and camp at the top?" "Okay!" Mike may not have known what I was signing him up for, but I had faith he would be able to handle it. Since it was late in the day, we would still camp at the backpacker's campsite the first night and then hike up the falls in the morning. So we used the remaining light to head towards Yosemite Valley and se e what it had to offer. The first glimpse you get of the majesty the park has to offer comes immediately as you exit the tunnel into the park, appropriately called Tunnel View. This just whets the appetite for what's to come. 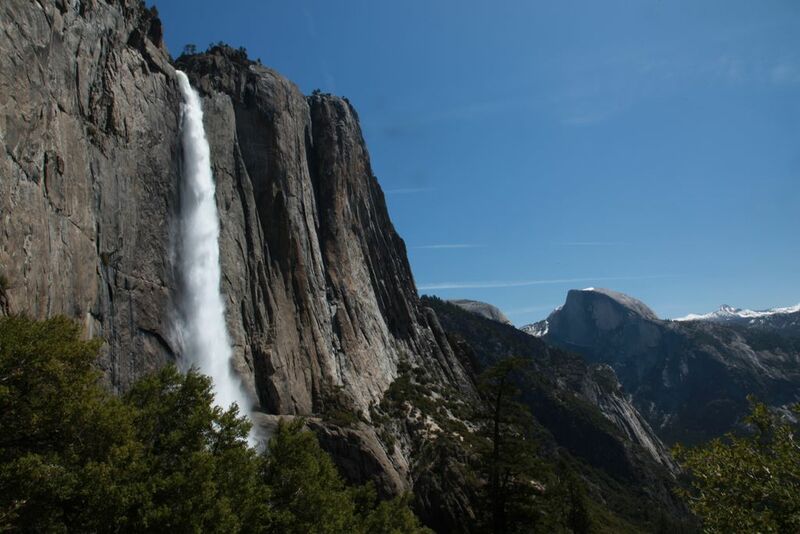 Once you get further into the park, the next thing you come across is Bridalveil Falls, which are the falls you see from Tunnel View. You also start catching glimpses of Yosemite falls and several other smaller falls scattered along the granite faces lining the valley. 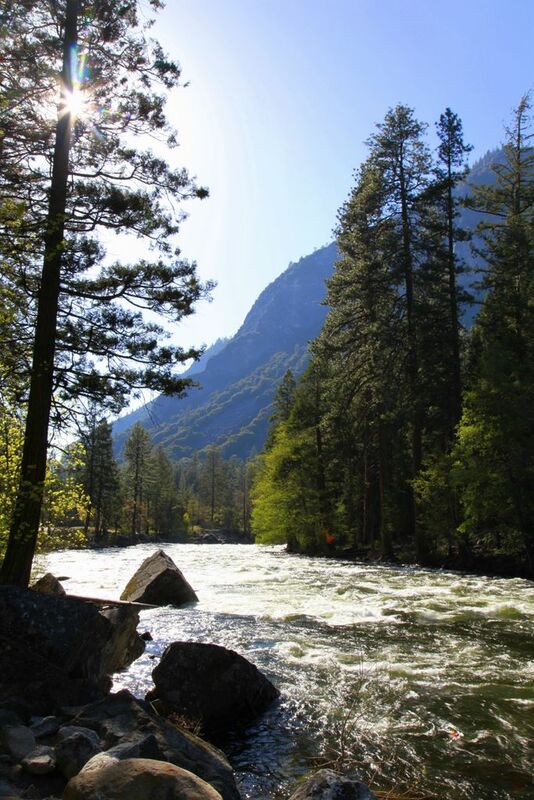 It all dumps into the Merced river, which is raging through the valley. During the peak flows, you also get quite a bit of flooding. It all lends itself to the charm of the park. As the sun started to set, I frantically tried to find the best place to take some pics. We went back to Tunnel View and Bridalveil Falls, but they didn't please me. We drove around the park taking random shots until we finally pulled over near a meadow. We looked to the left and there was a deer standing there surrounded by people. It certainly wasn't scared and if anything, was looking for an easy meal. I was able to snap a couple of decent shots and then we moved on. The downside of being in a valley with such steep rims is the difficulty of getting a good sunset shot. I would have been better off trying from Glacier Point or Sentinel Dome. I'll know next time! Once the sun went down, we made our way to the backpacker's campground. There were no signs posted anywhere for the campgrounds but we met up with another camper that helped us find where we needed to go. We threw down camp, played some cards and then crashed out around midnight. After struggling to sleep late (it got light at 5:30am), we packed up and were ready to head to our new campsite 5 miles and 2500 vertical feet away. We hopped on the free shuttle and got off at the Upper Yosemite Falls stop. Then we started our slow, slow ascent to the top. The trail starts off with switchbacks that literally go straight up. After hiking for 20 minutes, you can look straight down and see the bottom of the trail directly below you. You finally lose sight of where you cam from, but the switchbacks never stop. One additional hour of hiking gets you to a nice scenic overlook that gives you a view of the entire valley. 30 minutes later, you get to the lower falls, which is a beautify spot and gives you the best view of the falls. This also represents where a lot of people will turn around. Not that I blame them! The remainder of the ascent, you aren't able to see the falls but you do get gorgeous views of the valley. Finally, you reach the top and are rewarded with several amazing views. You can hike to the overlook and down some granite steps to catch a glimpse of the falls gushing over the edge. There is also a wooden bridge that allows access across the falls and heads off towards North Dome. After taking it all in and enjoying ourselves, we continued on to find our campsite. 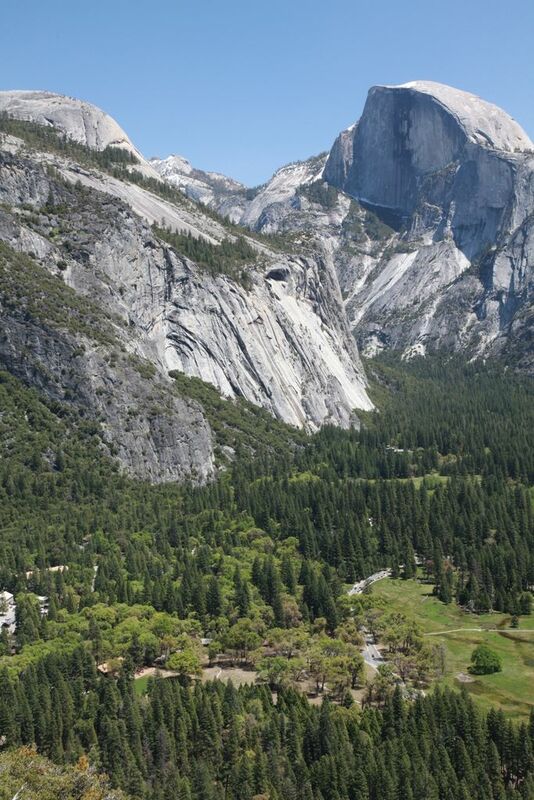 Once we passed Yosemite Point, the crowds of people were gone and we were happy to only see three more hikers. The tricky thing about camping in the wilderness in Yosemite is the campsites have to bee 100 feet from the trail, which means they may not be visible from the trail (since there are no signs for them either). As we're hiking along, the ground finally starts to level off and I see some flat areas off in the distance. I ventured off to have a look and sure enough, a campsite with a fire ring! Since it was supposed to be in the 30s that night, we desperately wanted a fire. Mike was also wearing regular tennis shoes which were now wet and needed drying. So we set up camp and made sure we had enough fire wood. 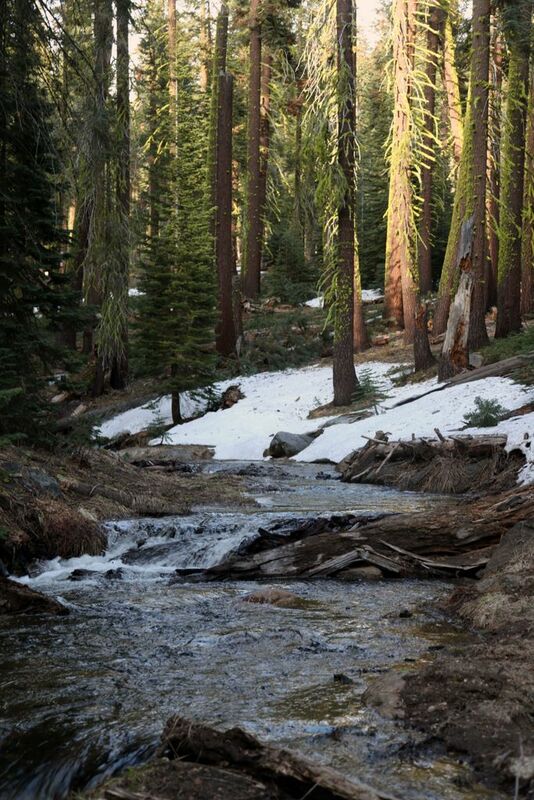 We decided that we could get water from the snow melt near the stream. While we were sitting and relaxing, we saw someone running (yes, running) on the trail. Every few minutes, he would exclaim "DAY-O!" I assumed he was tying to make noise to scare off any bears that might be up there. Mike thought that sounded like a good idea and used it as well (half jokingly) to scare any potential bears. After relaxing a bit, we decided that we would venture off to North Dome to watch the sunset. Along the way, we started to encounter more snow and several stream crossings. All of this made it difficult and more time consuming than expected. As a result, we were still two miles away from North Dome and the sun was going down. Instead of pushing on, we turned back and headed to camp. The entire way back, I kept trying to find somewhere we could peek out and see the sunset, but no luck. It wasn't until we were back at the campsite that I realized we had some pretty nice views. Unfortunately, we missed most of the good parts because we were trudging around in the forest. I was still able to capture some of the pinks in the sky before night fell. 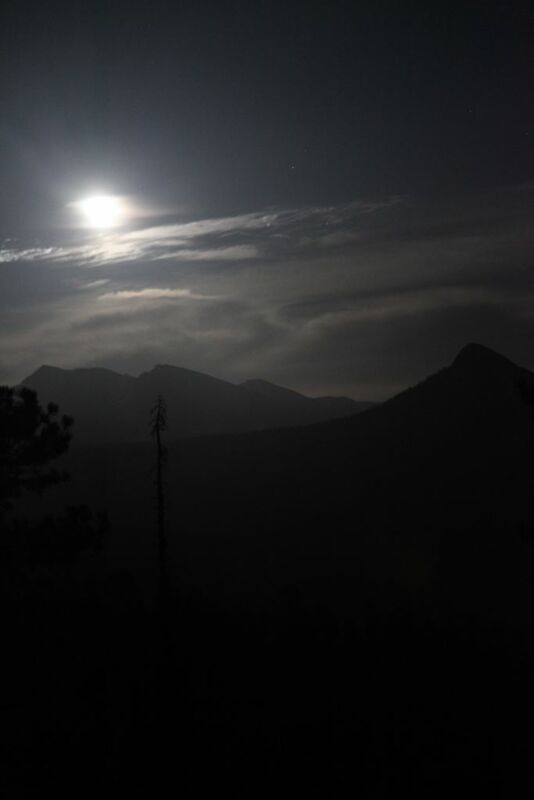 As we got the fire going, we saw the full moon rising. It looked amazing, but without a tripod, it was going to be difficult to photograph. I decided I would try some shots from a rocky outcrop not far from the camp. As I lay on my stomach trying to balance the camera for a long exposure, all of a sudden I heard a growl. Being in bear country, I was a little worried but I realized that it was probably just my stomach. That was my queue to go eat dinner. After burning a few logs, we were exhausted and called it a night. The next morning, we packed up and headed down the mountain. We snapped plenty of shots along the way and enjoyed the peace and quite while it lasted. Once we got back to the Yosemite Falls overlook, it was about 10am and people quickly started showing up. Having had our fill, we made our way back to the bottom, had lunch at the grill, and exhaustedly headed home. 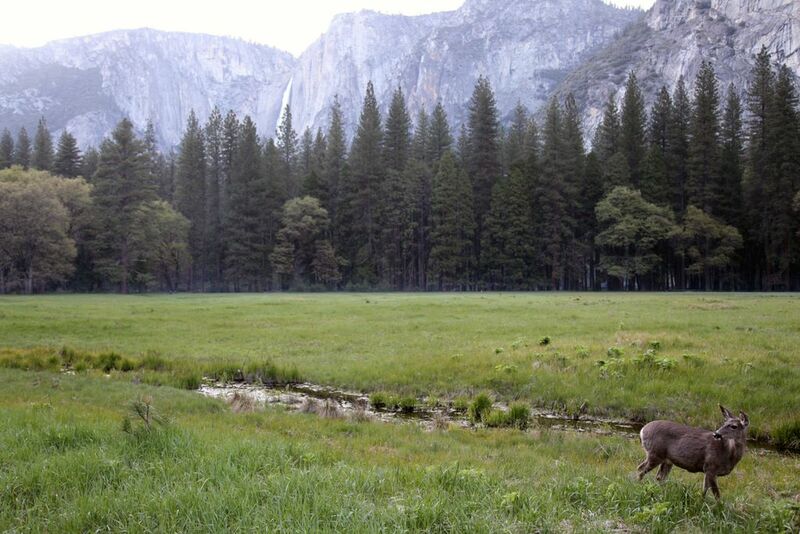 I read that Yosemite gets 3.5 million visitors a year, and nearly all of them go to the valley. So while you get some amazing views from there, you have to hike to get away from the crowds. And it is so very worth it. This was a wonderful experience and I look forward to coming back to this park frequently.